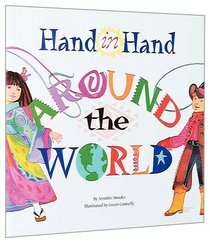 About "Hand in Hand Around God's World"
Brief text and illustrations introduce children from around the world in their native dress. The book unfolds into a frieze revealing the children all holding hands. This beautifully illustrated book introduces young children to different ethnic groups from around the world & celebrates how God loves them all.